Suppose you could follow every single stock listed on the NYSE and track every few seconds how many of the stocks were trading on upticks versus how many were trading on downticks. What would that information tell you? A buyer who wants to own shares aggressively will execute with a degree of urgency and will pay up for those shares. Such lifting of offers will cause stocks to trade on upticks. Conversely, a seller who wants out of shares aggressively will also execute with urgency and will accept the bid price. This hitting of bids causes stocks to trade on downticks. By calculating the number of stocks trading on upticks minus those trading on downticks every few seconds, the NYSE TICK ($TICK on eSignal feed) is an immediate, real time sentiment survey. It is based on the actual transactions in a broad stock universe and thus represents what traders are actually doing, not just what they say they'll do in a survey. 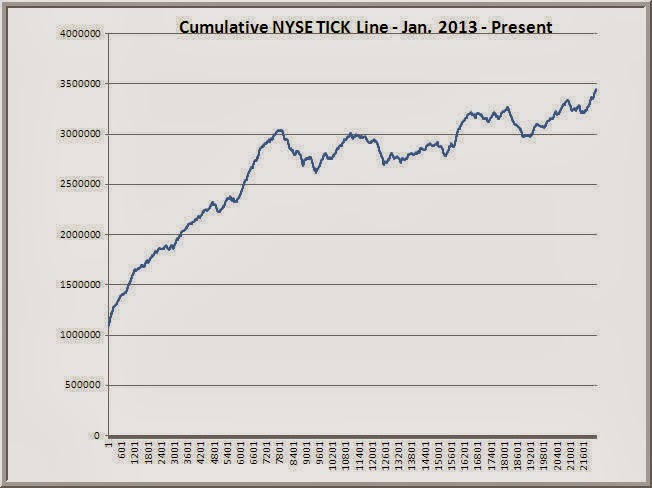 One application of NYSE TICK is to take the intraday readings and create a cumulative line, similar to an advance-decline line. As you can see above, that cumulative line has been making fresh bull market highs. That tells me that market participants remain net buyers. Note how selling pressure was restrained during the most recent market tumble. That was a great tell that the down move was a correction in a rising market, not the start of a bear market. There are many other applications of TICK as well. For instance, since 2012, individual readings that exceed about +900 or fall below -900 represent two full standard deviations from average. That tells us that there is significant buying or selling pressure across the broad stock universe. Note that such buying or selling has to be broad based, as you can only get those extreme readings if stocks beyond the S&P 500 list are lifting or selling off. To get those extreme TICK readings where so many stocks are upticking or downticking simultaneously, we need to see institutional participants aggressively buying or selling baskets of shares. That is an excellent sentiment clue. For instance, after early selling that took TICK to the -740 area during Friday's session, buyers entered in force and drove TICK above +1000. From that point forward, more stocks traded on upticks than downticks. That was a nice tell for the coming upward trend day. And what if NYSE TICK readings stay pretty much between +500 and -500 for the day? That is often a good indication that institutions are not participating aggressively and that there is little directional demand or supply for shares. That can be a good clue alerting us to slower, rangebound trade. So much of successful short-term trading boils down to rapid pattern recognition, derived from plenty of observation. I have archived one- and five-minute TICK readings for years and studied their nuances. For me, it's been a great tool for identifying who is in the market and which way they're leaning.